Since the mid-19th century, Palermo was known as the hive of Mafioso activity. 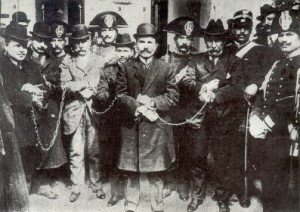 The genesis of the Mafia began under feudalism, whereby the nobility owned most of the land and enforced law and order through their private armies. In countryside towns that lacked formal law, local elites responded to banditry by recruiting young men into “companies-at-arms” to hunt down thieves and negotiate the return of stolen property, in exchange for a pardon for the thieves and a fee from the victims. These companies-at-arms were often made up of former bandits and criminals, usually the most skilled and violent of them. While this saved communities the trouble of training their own policemen, it may have made the companies-at-arms more inclined to collude with their former brethren rather than destroy them. On the other side of its much-debated history, my grandmother told me that the mafia actually started out as a benign organization. That it was mainly created to protect the women and children.